The cooler temperatures this week have reminded me that fall is just around the corner. Soon, the leaves on trees will be changing and the days will be getting shorter and shorter. I wanted to take some time and look at this process of how leaves change colors. I came across this article, “Why leaves change color” and highlight some information in the article. Carotenoids – Produce yellow, orange and brown colors..
Anthocyanins – Give color to various fruits and appear in watery liquid of leaf cells. Both Chorophyl and carotenoids are present in the chloroplasts of leaf cells. Most anthocyanins are produced in the autumn. As the night length increases in the autumn, chlorophyll production slows down and then stops and eventually destroys the cholopyl. The carotenoids and anthocyanins are present in the leaf and unmasked and show their colors. Oak leaves turn red, brown, or russet. 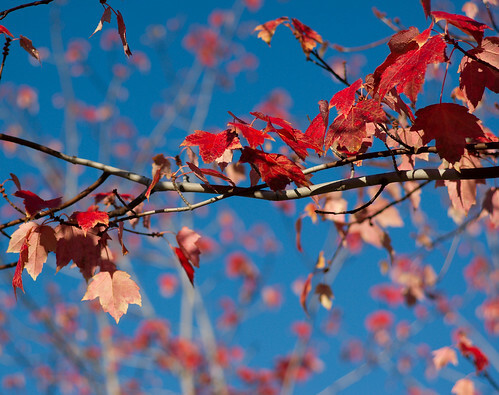 Maples turn brilliant scarlet as examples. The amount and brilliance of colors developed is a direct result of the weather conditions. A succession of warm, sunny days and cool, crisp but not freezing nights seems to bring about the most spectacular color displays. During these days lots of sugars are produced in the leaf but the cool nights and gradual closing of veins going into the leaf prevent these sugars from moving out. Also, the amount of moisture in the soil affects the color. A late spring or severe drought, can delay the onset of fall color by a few weeks. A warm period during the fall will also lower the intensity of the autumn colors. In addition, a warm wet spring, favorable summer weather and warm sunny fall days with cool nights should produce the most brilliant colors. The veins that carry fluids into and out of the leaf gradually close off as a layer of cells forms at the base of each leaf. These clogged veins trap sugars in the leaf and promote the production of anthocyanins. Once this separation layer is complete and the connecting tissues are sealed off, the leaf is ready to fall. The leaves that fall are not wasted, they decompose and restock the soil with nutrients and make up part of the spongy humus layer of the forest floor. In addition fallen leaves also become food for numerous soil organisms that are vita to the forest ecosystem.